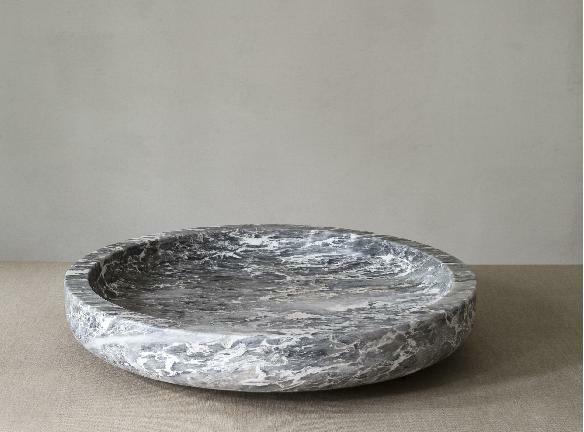 Belgian designer Michaël Verheyden creates uncommon objects for common rituals. Blending serene shapes and meandering materials into pure, refined creations. All objects mirror their creator: caring, thoughtful. “But, the obvious is never obvious”, Michaël Verheyden says, referring to the silent, yet story-telling shapes he creates. Revealing his quest for simplicity, against the backdrop of a rapidly changing world. “We need to feel grounded again”. Which is why his objects combine a global appeal with unveiled roots. Craftsman Verheyden prefers noble and durable materials that feel natural and age beautifully. Marble, leather, bronze, oak. “The obvious is never obvious”, states Michaël Verheyden, reflecting upon the creation process behind each object – which spans from design to the actual manufacturing. All under one roof. “Our home houses our atelier”, Verheyden explains. With a sparkle in his eyes, he continues: “so we are literally at home in our atelier”. Lingering for the power of silence, loving the strength of caring. Welcome to Michaël Verheyden’s home and world.